Are you getting ready to dress up your flower beds this year? Before you get out there and begin to gather by color or texture, read this primer for understanding the nursery pot tags. 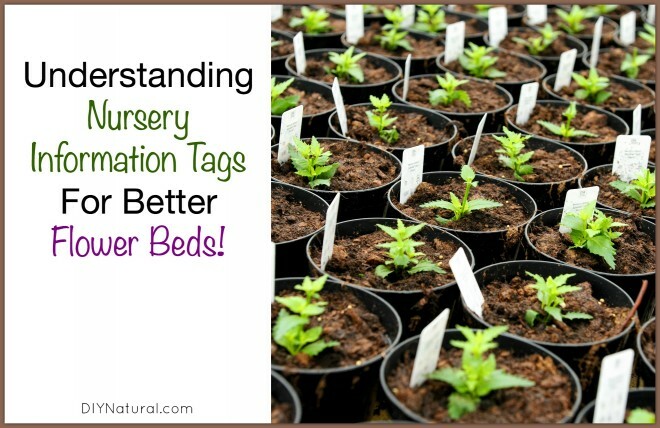 Whether you call them garden markers, plant labels, markers, or tags, they’re the little plastic tags that come with nursery plants to help explain the plant and how to care for it. If you don’t have a little help, it can be confusing to understand just what is meant by: partial sun, zone 6, average watering, etc. A sure winner is to pick the plant that fits your bed the best and you’ll be guaranteed the prettiest house on the block! On each tag or entry in a catalog you should see both the common name (Echinacea) and the latin or scientific name (Echinacea purpurea). Without the latin name you can’t be assured of the plant specimen you are buying. This is most important if you are buying something for food or medicine. If you are just growing for ornamental reasons you may at the very least be disappointed when something unexpected grows where you planted your highly anticipated flower variety. The latin name is a global naming standard that ensures that, although a plant may have hundreds of common nicknames, there is only one scientific name that is used in any climate on the planet for that specific plant. The first name is the genus and the second name is the species. The first name is always capitalized and the second is lower case and they are always in italics. Sometimes you may see this, Echinacea purpurea var. Sunset. The var. abbreviation simply shows a cultivar, or variety of the species E. purpurea. NEVER buy from a nursery or seed provider that does not list the latin name. What happens if we ignore the sun requirements? If you put a shade plant in full sun you will most likely get a burnt plant. It may try a few years to come up from the roots and quickly wither. Eventually it will quit trying. A sun plant that you place in the shade will bloom less than you expect. You will often notice that it develops much larger and wider leaves than other specimens. This is because the plant is trying to create a large surface area to collect as much light as possible. Full Sun: This plant requires a minimum of 6 hours a day of sun and it’s a good idea to keep it watered. Partly Sunny: This plant requires 3-6 hours of sun. The preference is that it gets morning and early afternoon sun but it isn’t averse to afternoon sun and the focus is more on the minimal amount of light. Part Shade: This plant requires 3-6 hours of sun with protection from afternoon sun. Full Shade: This plant requires less than 3 hours of sun and can receive filtered sun the rest of the day. This plant MUST have some sun so don’t put it in the dark. Dappled Sun: This plant requires a minimum of 3 hours of sun and no more than 6 hours. The sun must be filtered as if the plant were growing in a forested area. Drought Tolerant: This plant has adaptations that allow them to survive periods where there is no water. This plant requires a small amount of water on occasion. Average Water: This plant can be watered every time the soil dries out. This is a scale kept current by the USDA. As our weather continues to shift on a living planet the zones shift, so check every few years to see where you fall. The zones measure the average lowest temperature in an area. If your plant is listed as a Zone 5 plant it means that it can live through a winter with temperatures between -23.3 and -28.9 degrees Celsius and still come back out of hibernation the following spring. The scale goes from 1 (-51.1 to -45.6 degrees Celsius) to 11 (15.6-21.1 degrees Celsius). See the USDA Plant Hardiness Zone Map here to determine your zone.